Norbert G. Maroya is an Agricultural Engineer specializing on plant breeding with a Ph.D. from the Department of Botany, University of Ghana Lagon. He worked from April 1985 to July 2000 in agricultural research in various positions starting as head of the Cassava breeding program of the National Agricultural Research Institute of Benin (INRAB). In August 2000, he joined the German Technical Cooperation as Regional Expert for Planting Materials of Root and Tuber Crops for the “Promotion of Seed Production and Marketing in West Africa”. In May 2002, he was recruited by IITA as Regional Coordinator of the West Africa Seed and Planting Material Network (WASNET), based in Accra, Ghana, where he worked till February 2007. He joined the International Crops Research Institute for the Semi-Arid Tropics (ICRISAT) as Regional Coordinator of the USAID-funded West Africa Seed Alliance (WASA) based in Bamako, Mali, from 2007 to 2009. From November 2009 to August 2010 he worked as Senior Advisor on Seed Policy and Public Partnership of WASA. 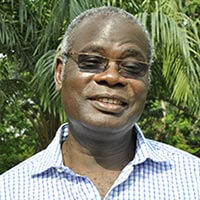 He returned to IITA in September 2010 as cassava breeder / geneticist based in Ibadan, Nigeria. He was in charge of breeding and selection of beta-carotene- enriched cassava. His areas of expertise includes seed project management, seed systems development, seed quality control and certification, foundation seed production, breeder seed maintenance, seed industry development, and seed marketing, among others. Since February 2012 he has been the Project Manager of the Yam Improvement for Income and Food Security in West Africa (YIIFSWA) funded by the Bill & Melinda Gates Foundation.